motivation to support your healthy lifestyle all week long – and it’s FREE! The start of a new year is an ideal time to reflect to reflect on where you are versus where you’d like to be and start making some positive resolutions to help you live a healthier, happier life. More than that and you’ll be overwhelmed and you’ll find yourself going back to your old habits faster than a bottle of Verve disappears on New Year’s Eve! 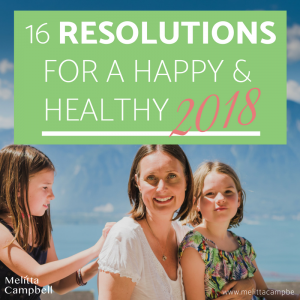 Stuck for ideas, here are 16 New Years Resolution ideas to help you enjoy a happier and healthier 2018. It’s hard to work towards something if you haven’t clearly defined what it is. Set yourself one clear goal per quarter (3 months) and then break this down into smaller milestones that you can celebrate along the way to keep you focused and motivated. Think about the small adjustments that you can make to your daily routine to help you make a step closer to your goal every day. Specific ‘Get fit’ is too vague for example; what exactly do you want to achieve? How do you want to do it? And why? Measurable You must be able to measure your goal so you can be clear about when you have achieved it. Accountable Taking personal responsibility for making your goal a reality is important. Keep a journal, use an online tracker or tell a trusted friend to help you stay motivated and moving forwards. Realistic Set a goal that you can realistically achieve given your current situation and resources. Be challenging, but not overwhelming. Timebased Set a time limit on your goal. Don’t make it too far in the future, remember, you can always set a second goal. Don’t make it too far in the future, remember, you can always set a second goal that builds on the lessons learnt in meeting the first one. Write your goal down and keep it somewhere where you will see it every day so you never lose sight of what you are working towards. Finally, each day visualise how you will look and feel once you reach your goal. This will help you focused and motivated. When you start your day right, you give yourself a stronger chance of staying focused and making healthier choices throughout the day. There are lots of options, but the idea is to get up without hitting the snooze button and set yourself up for a great day ahead. Reading books about health or inspiring biographies are a great way to motivate your healthy New Year. Just like reading more, walking more has lots of benefits besides keeping your waistline trim – which is reason enough already! As with all forms of exercise, walking prompts the brain to release ‘happy’ chemicals like serotonin and dopamine, that can lift your mood both during and after your walk. Walking can also lower stress and depression, strengthen your body and bones and ward of disease, with walking outdoors being more beneficial than a treadmill. It’s also the cheapest way to get exercise into your day…so no excuses, get out there already! Mobile phones have become an important part of modern life, but we don’t need to be attached to them 24/7. It’s not only fun, but can help build your self-confidence and support your good health. The great thing about most healthy recipes is that they usually contain around 5 ingredients, making them quick and easy to prepare. You’ll no longer have to rely on the pizza-delivery man and you’ll save a fortune on expensive ready-meals! Join my free Motivation Monday newsletter which includes simple superfood recipes each week. Getting healthy isn’t just about healthy eating and exercise, it’s also taking care of your mental and emotional health. Stimulate your grey matter by learning something new. Not only will you achieve personal growth, which is always good to do, but you’ll also be exposed to new opportunities and build your self-esteem and confidence. It will also allow you to meet new people and make new friends – did you know it’s been proved that people with more friends live longer, happier lives?! For this resolution, list all the things you’ve ever wanted to try out or improve, choose one, find a class or group that focuses on that subject and go for it! What about trying your hand at painting or pottery, you could join a local healthy cooking class, visit your local sports centre and see what inspires you or ask your friends and colleagues what they do they you might also enjoy. Water is essential for life. Around 60% of the body is made up of water, so it’s important to keep yourself well hydrated throughout the day. Drinking at least 8 glasses of water a day also helps you to effectively transport nutrients around your body, regulate body temperature and digest food. It also helps keep your skin clear, gives you energy, boosts your memory and helps maintain a healthy weight. Starting a home-business isn’t just about earning an extra income (though of course that’s an attractive benefit!). Starting a business that helps people look and feel better can also inspire your own healthy living journey. It’s also mentally stimulating and rewarding. With as little as 10-hours a week, you can start a side-hustle from home that you can fit in and around your existing commitments such as a job, studies or a family. This resolution is easier than you might think. Some home-business options (such as the one I offer) even provide you with free training and coaching, making it a very inexpensive way to learn new skills and meet new people too! You’ll find some helpful advice in this article on Why You Should Start a Home-Business in 2018. Life rarely goes according to plan, especially when you are pushing boundaries, learning new things and aiming high. But the unexpected can be a great mentor – we learn more from our mistakes than we ever do from what goes right first time. So embrace failure and recognise that it’s part of the process of working towards positive change. When it comes to getting fit and healthy, consistency is key. While you are welcome to exercise more than three-time a week, try to make three times your minimum so you can enjoy the full benefits from your activity and see and feel the difference. Space your workouts evenly to allow your body to recover in-between. If you have a busy schedule that makes going to a class or the gym difficult, try doing a home-workout by following a video or subscribing to a service like Grokker which offers hundreds of fitness videos so you can stay motivated. Keep your body healthy and energised, make a resolution to eat at least 5 portions of fruit and vegetables every day – ideally 10! Have fruit with your breakfast – defrost a portion of frozen red berries in the evening ready to add to your muesli or yogurt in the morning. Chop some carrots, peppers, celery at the start of the week to make them easy snacks. Prepare a healthy lunch or dinner ahead of time so you aren’t tempted to make a quick unhealthy dinner choice. Add a handful of peas or frozen spinach to all your home-made meals and sauces. Every morning put an apple, orange or banana in your handbag. Stock your freezer with frozen fruit and vegetables so they are always available. Have a smoothie every day – you can pre-chop and freeze bags with smoothie ingredients ahead of time to make them quick and easy. Drinking too much alcohol can take a serious toll on your health and wellbeing. Make a resolution to cut down your consumption in 2018. Try and abstain from drinking on weekdays and keep a stock of interesting healthy drinks like fruit juices, sparkling water and herbal teas to give you lots of healthy alternatives and help you stay on track. Self-care and relaxation are very important for your wellbeing so be sure to include this in your healthy living planning. Give yourself time to unwind and recover from the stresses of a busy modern life by scheduling regular ‘me-time’ appointments in your diary. Taking at least 3 x 10 minutes during each day as well as longer periods of relaxation during your week will do you the world of good. Sometimes the best way forward is to take time out to do nothing at all! 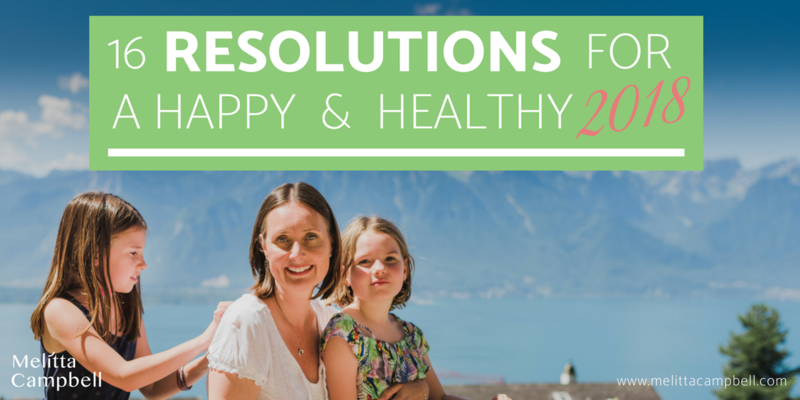 Since we looking at resolutions that will make you feel healthy and happier, the list would not be complete without including smiling. Have you set out your resolutions yet? What’s worked well for you in the past? How you can Look and Feel better in just 9 days! Some great tips here – interestingly I have a similar post that publishes tomorrow with some of the same recommendations.